Explore the holy pilgrimage city of varanasi along with Allahabad, the destination of Kumbh Mela. Arrival at Allahabad airport or railway station. Upon arrival our representative / driver will receive you and assist you to transfer to the hotel. Rest of the day free at your leisure. Early morning enjoy Boat riding in river Ganges. Later full day sightseeing of Varanasi city which includes the visit of Sarnath , Ashoka Pillar, Sarnath Archaeological Museum, Dhamek Stupa and Chaukhandi Stupa, Dashaswamedha Ghat, Rajghat, Man Mandir Ghat, Golden Temple, and Gyan Vapi, Durga Mata Temple, Tulsi Manas Mandir, and Banaras Hindu University. Overnight stay at the hotel.Evening witness Ganga Aarti at ghat. Overnight hotel in Varanasi. After breakfast drive to Allahabad. It is one of the four venues of the "Kumbh Mela". Upon arrival check into Camp.Later visit Allahabad Fort-The massive fort built by emperor Akbar in 1583 A.D., the fort stands on the banks of the Yamuna near the confluence site. In its prime, the fort was unrivalled for its design, construction and craftsmanship. Visit Patalpuri Temple-Within this underground temple, inside the fort, lies the Akshaya Vat - or the immortal tree. Believed to have been visited by Lord Rama, the temple was also seen by the famous Chinese traveller and writer Hiuen Tsang during his visit to this place. Also visit Asoka Pillar-This gigantic Ashoka pillar, of polished sandstone stands 10.6 meters high, dating back to 232 B.C. The pillar has several edicts and a Persian inscription of Emperor Jahangir inscripted on it, commemorating his accession to the throne. Swaraj Bhawan-The old Anand Bhawan, which in the year 1930 was donated to the Nation by Moti Lal Nehru, to be used as the headquarters of the Congress Committee. Moti Lal Nehru renamed it as Swaraj Bhawan. Late Prime Minister of India, Mrs. Indira Gandhi was born here. Finally visit Allababad Museum-The museum has a good collection of sculpture, especially of the Gupta. Also sped your time at Triveni Sangam. Dinner and overnight stay at Camp (Tented Accommodation) Hotel accommodation also available. Breakfast at hotel/ camp Rest of the day free to explore the Kumbh Mela.Dinner and overnight stay at Camp in Allahabad. (Tented Accommodation) -Hotel accommodation would be available at additional cost. Breakfast at the hotel/camp. 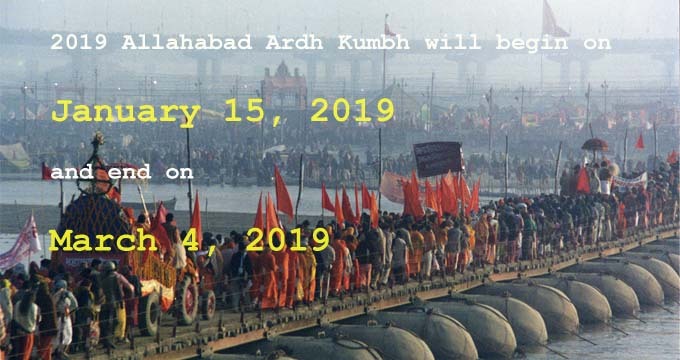 Rest of the day fyou are free to explore Kumbha Mela and can take a Holy dip at Triveni Sangam.There are other options to explore like Hanuman Temple, Akshya Vat, Allahabad Fort and other places. You can also experience different camps of Akahras. Lunch and dinner will be served at Camp. Overnight stay at Camps (Tented Accommodation) Hotel accommodation also available. Full day free to explore Kumbh Mela. Lunch and dinner at Camp. Breakfast at camp/ hotel. Later drive to Varanasi . Upon arrival you will be dropped-off at the airport/ railway station for onward journey.